If you often use your iPhone to send or receive messages, all the SMS messages are on your iPhone, once your iPhone was lost or stolen, how to recover lost iPhone text messages? After update your iPhone 5c, iPhone 5s to iOS 7 cause lost SMS, how to recover iPhone SMS from iPhone iOS 7? Is there an easy way to recover deleted SMS text messages from iPhone 5s/5c Plus on Mac? Texting messages with your new iPhone is a really good experience, we can not only send SMS or MMS with iPhone, but also iMessages with it. Nowadays, iPhone users may have already get used to deliver all kinds of information via text messages, and sometimes we will have to clean up the message box to free up the storage space. However, after we delete the messages, we may regret as we find some messages are still useful. And the text messages cannot be recovered from iPhone directly, we have to use iTunes or iCloud to get the messages back. The following post divides into 5 parts, which will show you 5 methods to recover deleted messages from iPhone. And the post will take iPhone 5s as an example. iTunes and iCloud both backup the data in your iPhone as a whole so you can only get all the data in the iPhone backup together back to your iPhone. If you want to recover deleted text messages from iPhone 5s separately, you may need third party iPhone data recovery software. 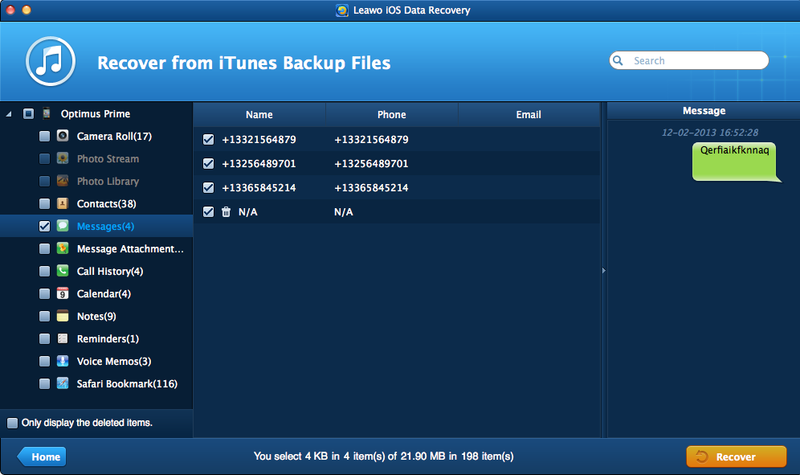 I would like to recommend Leawo iOS Data Recovery to you because this software is helpful and easy-to-use. It is used for recovering lost files from iDevices and iTunes backups. The software also enables users to backup iPhone, iPad and iPod touch files to computer. Leawo iOS Data Recovery will export the recovered text messages to CSV and HTML files so that you can view the files with your computer. The following guidance will show you how to recover deleted text messages from iPhone. You are able to free download the software and have a try yourself. Note that the trial version stops at the preview window. 1. 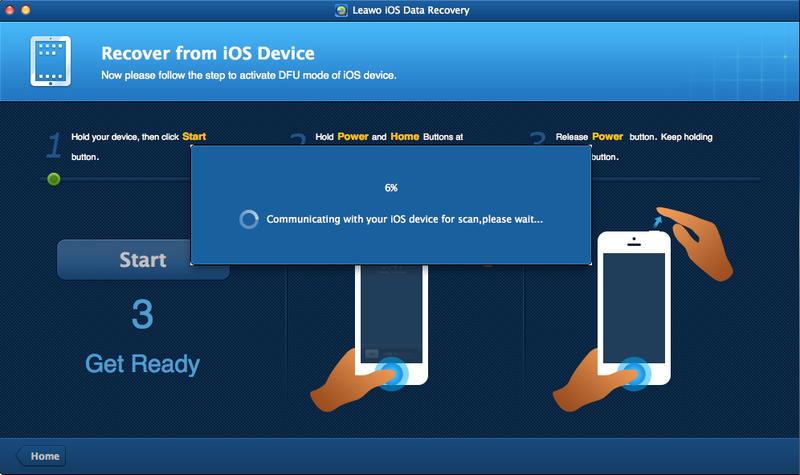 Run Leawo iOS Data Recovery on your computer, and you will see three recovery modes in the main interface, including “Recover from iOS Device”, “Recover from iTunes Backup”, and “Recover from iCloud Backup”. 2. Choose “Recover from iOS Device”, and connect iPhone to computer with the USB cable. The software will recognize your iPhone and check it at the bottom list. Click the “Start” button in the window to let the software analyze your iPhone 5s. 3. After the Analysis of the iPhone, the software will begin scanning the contents in the iPhone. When the scan is done, the names of the categories in the left sidebar will turn white. Choose “Messages” and then the contents will display in the right part of the window. Check the messages you need and then click the “Recover” button at the right bottom of the window. 4. 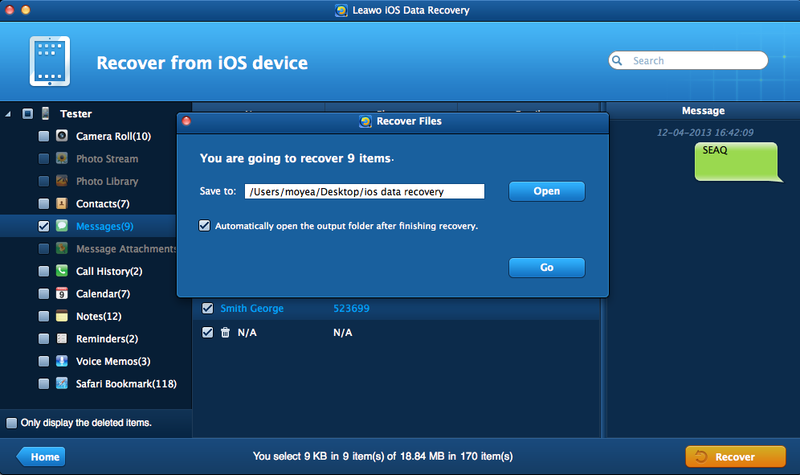 The dialog of recovery settings pops up after clicking “Recover”. Click “Open” in the dialog to choose a target folder on your computer and then click “Go” at the right bottom of the dialog. 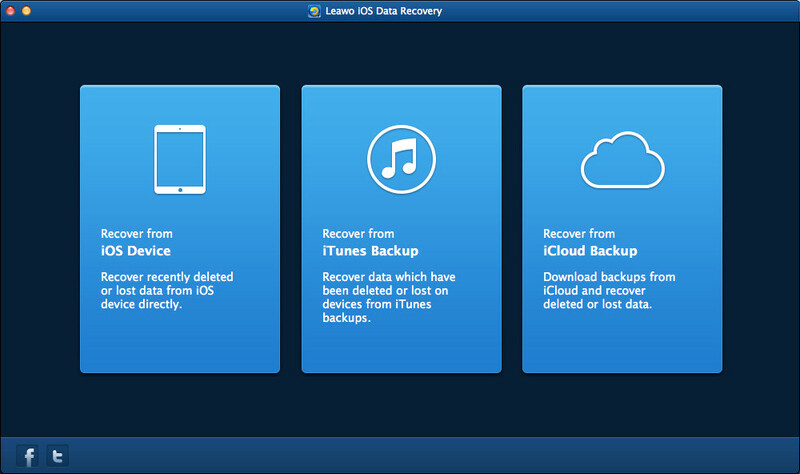 As you may have seen in the main interface of Leawo iOS Data Recovery, this software also provides a “Recover from iTunes Backup” function, which means it can help you to retrieve deleted messages from iPhone backup. The following guidance will show you how to do that. 1. 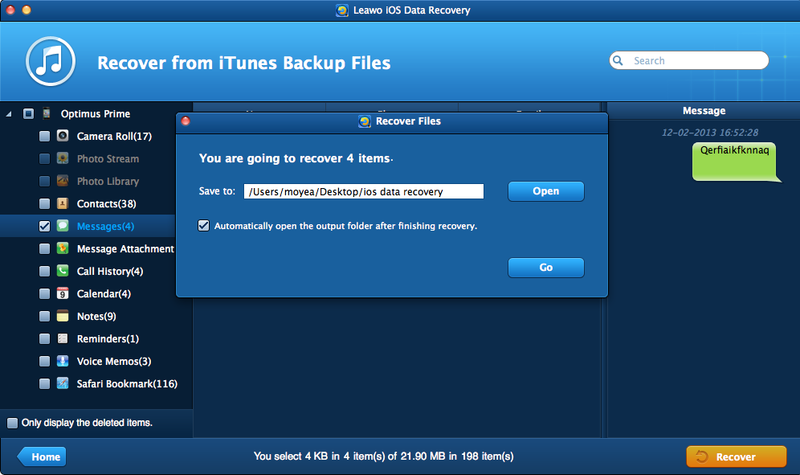 Start Leawo iOS Data Recovery, and choose “Recover from iTunes Backup” in the main interface. The software will display all the backups you have created on this computer. Choose the iPhone backup and click “Scan” at the right bottom of the window. 2. This iPhone data recovery software will scan the contents in your iPhone backup. It lists 12 categories in the left sidebar, and allows you to choose after the scan. Choose “Messages” when the scan is finished, and then the contents will be shown in the right part of the window. Check the messages you need and then click the “Recover” button at the right bottom of the window. 3. After clicking the recover button, you will see a pop-up dialog. Click “Open” in the dialog to choose the folder to save the exported messages. Then click “Go” to start retrieving deleted messages from iPhone backup. When the recovering process is done, you will get the messages in the target folder. The messages will be saved in a CSV file and an HTML file, and they can be viewed on your computer directly. 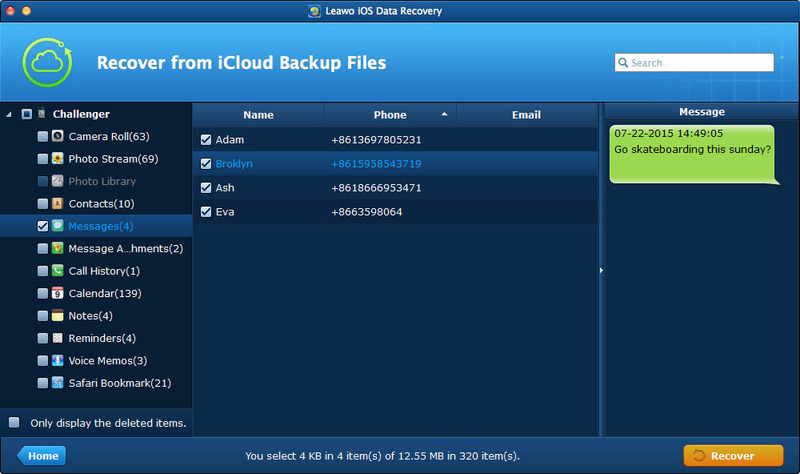 Leawo iOS Data Recovery also enables users to extract data from iCloud backup. When iPhone 5s users have lost their text messages in device, they can extract the data from the cloud with the help of this iPhone data recovery software. The following guidance will introduce the method in detail. 1. 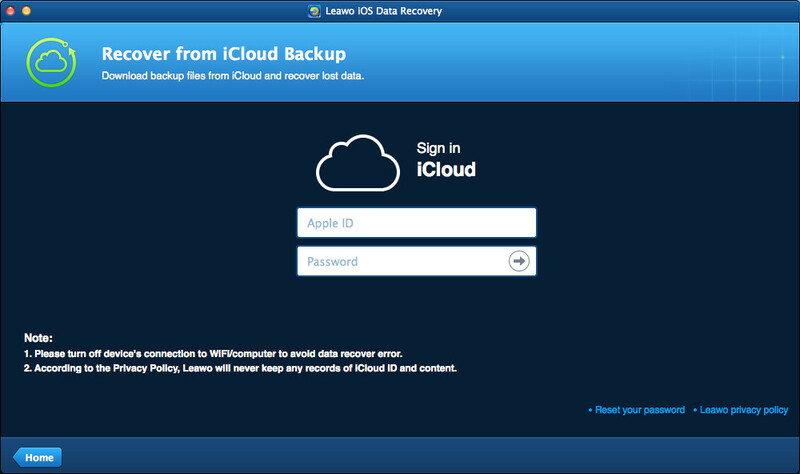 Run Leawo iOS Data Recovery and choose “Recover from iCloud Backup”. Then the program will ask you to log in iCloud with your Apple ID. Note that the Apple ID should be the one you use with your iPhone 5s. 2. The program will display the backups you have made with this Apple ID. Choose the iPhone 5s backup and click Download at the right bottom. 3. 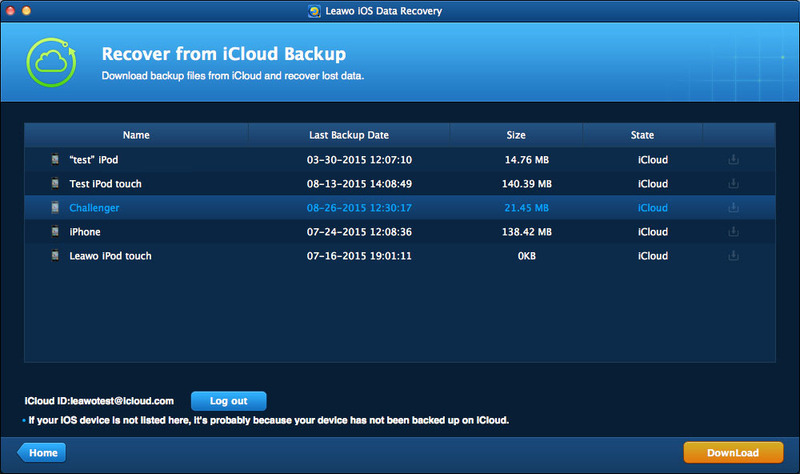 Leawo iOS Data Recovery will download and scan the iCloud backup. Check Messages when the scan is finished, and select the messages you need. Then click Recover. 4. You will see a pop-up dialog after clicking the recover button. Click Open in the pop-up dialog to choose a target folder on your computer to save the text messages. Then click Go to start extracting text messages from iCloud backup. Some iPhone users recently updated from iPhone 4 to iPhone 6s/SE, and they wonder that if they are able to retrieve deleted messages from iPhone 4 and then import them to their new iPhone. In fact, Leawo iOS Data Recovery will help iPhone 4 users to retrieve deleted messages from iPhone 4 to computer under DFU mode, but it doesn’t support to import recovered messages to iPhone. If you are in need of retrieving deleted messages from iPhone 4, you can check out the following guidance. 1. 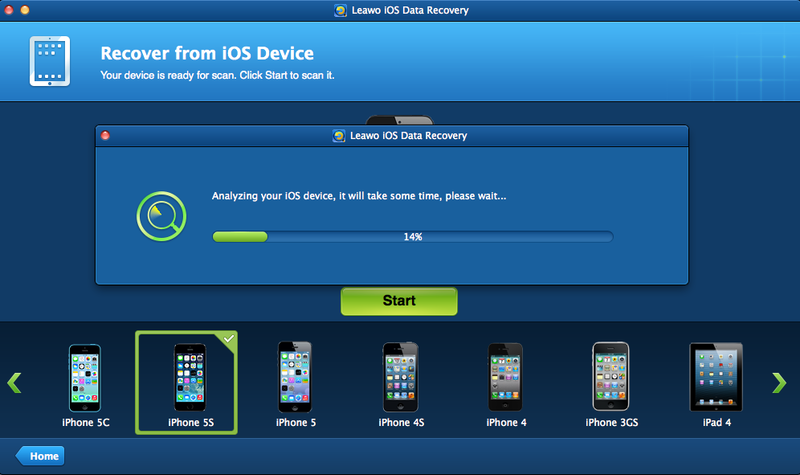 Start Leawo iOS Data Recovery, and then choose “Recover from iOS Device”. Connect your iPhone 4 to computer with the USB cable. The software will recognize your iPhone and show a manual about entering DFU mode on iPhone 4 in the main interface. 2. Enter DFU mode manually on your iPhone 4, and then the iPhone data recovery software will start to scan the contents in your device. The software also shows 12 categories in the left sidebar, and you are allowed to choose “Messages” when the scan is done. Check the messages you want to recover and then click the “Recover” button at the right bottom. 3. The dialog pops up after you clicked the recover button. Click “Open” to choose a folder to save the exported messages, and then click “Go” to start retrieving deleted messages on iPhone 4. Leawo iOS Data Recovery will help you to recover text messages from iPhone separately so that you won’t get messed data in your iDevice. Moreover, this software also enables users to backup iPhone, iPad and iPod touch files to computer, for example, you can recover deleted notes from iPad with it. 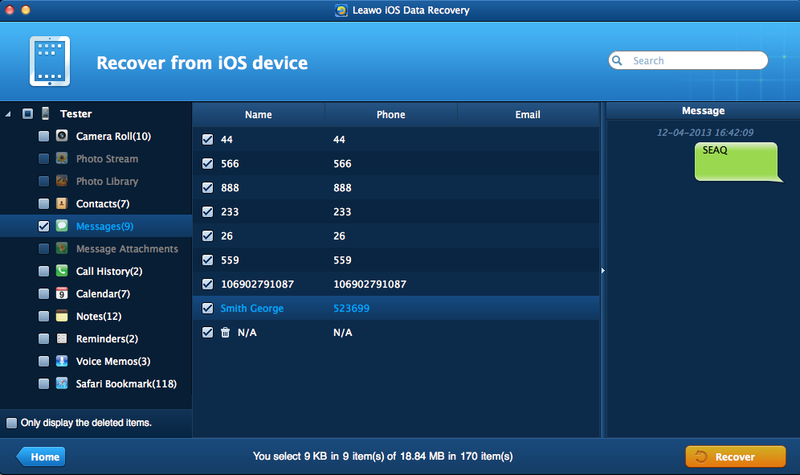 If you are interested in Leawo iOS Data Recovery, just free download it to have a try.